Hello all, first post from a new member. I'll start with what seems like a stupid question, what am I doing wrong. I have an RO 150 and cannot get the pad to lock so I can unscrew and change the sanding pad? It only locks in the aggressive mode. Hi SR, thanks for the welcome. Yes, after no success I found that in the Manual, but is will not lock even in rotary mode. It can be difficult, I have been known to use a chopstick to wedge the motor and housing while turning the pad itself. The green button on the side does not just push in, it goes in and down I believe. 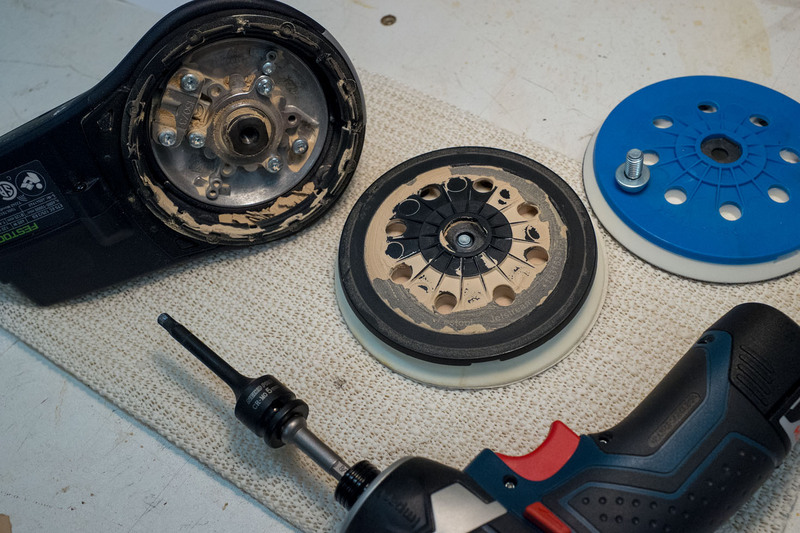 When you remove the pad with wedge method look at the action of the button to see how it engages the fan blades to lock the motor. Thanks Jim, will try the chopstick method. I had the same problem with my ETS EC 125 - eventually I had to use an impact driver to break the bolt loose. The RO150 has a twist off pad. No bolt to remove. But, yes, the pads can be hard to turn while holding the button in firmly. There's a bit of confusion here: I'm not for a moment suggesting any misinformation, however there's at least 3 different generations of Rotex 150 sanders around, each with its own quirks. The first 2 had a standard M8 screw affixing pad to base (just as with the Festo ETS machines), and the late/st model has a different bayonet attachment. The bayonet version has a relatively simple twist on/twist off pad action, somewhat let down by the longer term tendency to loosen up over time, vibes & wear. I've seen some machines in which the pad has required gluing onto the base so as not to repeatedly fall off. A desperate solution to a ridiculous problem! The earlier versions (in common with almost all other sanders) have yet another suite of quirks. The M8 pad screw really requires a washer to tighten & release effectively, however this will on occasion allow particularly resinous ultra-fine dust ingress to the screw threads, where a combination of heat & pressure may form a natural type of "Loctite" which effectively welds the screw in place within its female receptor. This is quite a common occurence, particularly in well-used machines with infrequent pad exchange. The interweb is awash with anecdotes of puzzled owners frustrated with their solidly locked pad screws. Given that the pad has 2 keyways that mate with corresponding cutaways on the tool's arbor, this allows the operator to use the pad itself as a firm purchase to allow the initial counterclockwise screw rotation. To initially crack the seat of a badly stuck screw may require the liberal but careful application of some type of resin solvent (of the petroleum/kerosene/white spirit type) or penetrating thin (i.e. not at all viscous) lubricating oil of the CRC/WD40/Inox families into the central pad well of an inverted sander. Allow it to soak for some time (hours if necessary), with repetitive small doses more effective than trying to flush the offending resins away. Plus a firm hand.